This is our brand Tangkula new desk. It is really fashionable. And it occupies little space because of its compact design. It is also very useful. You can put your computer or laptop on it and enjoy surfing the Internet or reading. You can also put other things, such as books, photo frames and so on. It's easy for you to use and can make your indoor life become more comfortable. When you are at home, you can just sit before this desk and finish your activities. The construction of the desk is innovative which adds elegance to your room. This product is stable and can serve you for a long time. And it has a drawer in which you can put you things. It is convenient. What a perfect desk! Don't hesitate to buy one! 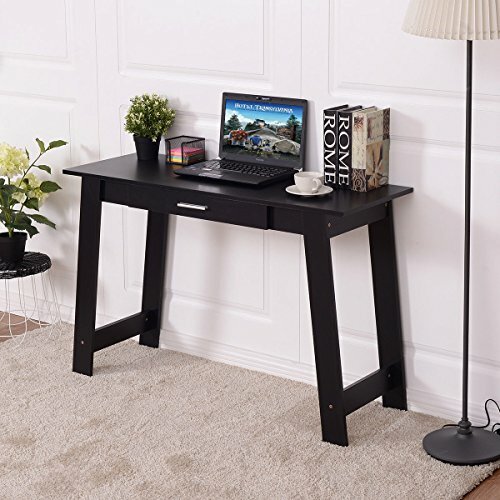 Exquisite Appearance and Sturdy Construction: Made of wood construction, it is sturdy and durable, a classic, timeless style, the desk is the perfect place for a small work station. Full Extension Slippery Course: You can place the small stuff or other thing you need and with full extension drawer slippery course, you can easy to slid the drawer and keyboard shelf. Furniture Designed for Small Space Living: Its compact structure and beautiful finish can surprisingly highlight your office or home decor. Large Desktop Space: You can place computer, book, mini printer, books and so on. It's easy for you to use and can make your indoor life become more comfortable. Multifunctional: It can be use as a computer desk in your sturdy room, or as a Console Table to add a decor for your home. TANGKULA Computer Desk Multi-Function Adjustable Home Office Workstation Modern Style Writing Study Table with 4 Tier Bookshelves.